Could Manny Acosta be Mets’ 2012 closer? Shudder to just think of it a couple of months ago. After a horrible start, Manny Acosta has been lights out lately. 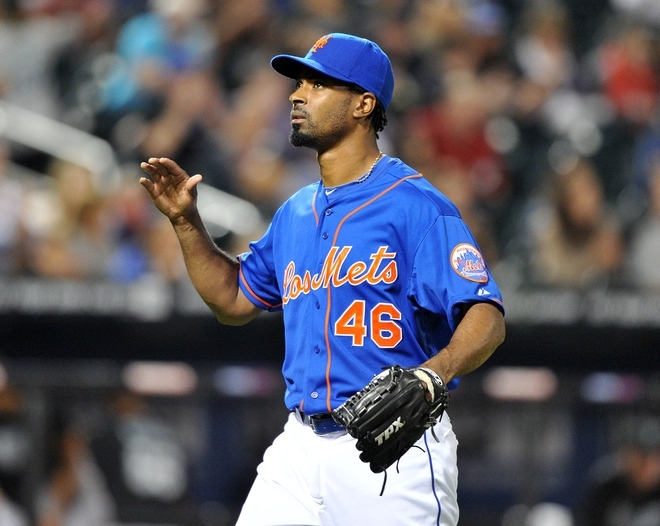 Which begs the question: Can Acosta assume the role of closer for the 2012 Mets? It goes without saying that Acosta has thoroughly been the Mets most consistent and reliable arm out of the bullpen for the better part of two months. In his last 29 outings (consisting of 29.2 innings) Acosta has only surrendered six runs (four earned) on 23 hits. In that span, Acosta also has an amazing 34 strikeouts to just seven walks allowed. Clearly, Acosta is on top of his game. He has harnessed his stuff quite nicely and is commanding the strike zone like no other time in his time with the Mets. Acosta is just brimming with confidence. In his first attempt as closer on Wednesday, Acosta came in with a 1-0 lead and made quick work of the Marlins, striking out two batters while hardly breaking a sweat. Again, it begs the question, can Acosta really be the Mets closer in 2012? Most will scoff at the notion, but can anyone really be satisfied with Bobby Parnell’s audition? Parnell, has and will be given every opportunity to cement his status as the Mets closer of the future. But the more and more we see Parnell struggle, one might be inclined to think that he just may not have the mental toughness to handle this job. Sure, Acosta, in his two years with the Mets, has sporadically shown flashes of brilliance, but more times than not he has left Mets’ fans disappointed. I would be hard-pressed to argue with that notion. However, maybe just maybe Acosta has figured how to trust his fastball and his secondary pitches enough that he now ‘gets’ it. Acosta’s poise and presence on the mound these days is very calming. Acosta hardly gets rattled and is now thriving in high leverage situations. For a closer to be successful, one must have a great ability to make batters swing and miss, which Acosta has done in spades in the last two-plus months. Acosta is no over-the-hill pitcher either. At age 30, he has plenty of gas in the tank. And with the Mets in a cost-cutting budget mode, the arbitration eligible Acosta will be quite the cheap investment. Don’t expect Sandy Alderson to go spending any money on a closer, especially after fighting tooth and nail to free himself from a crippling contract that ex-closer Francisco Rodriguez was entitled too. So, the quest to become the 2012 Mets closer will likely come down to Acosta and Parnell. While Jason Isringhausen has made for a good story, he will not be the closer for the Mets next year (or any team for that matter). Another option could be Pedro Beato. However, Beato has hit a wall and is just now coming out of his funk. It’s doubtful that the Mets will entrust Beato with that kind of pressure, at least not initially. Parnell has to figure this game out and do it fast. His chances of being a major league closer are becoming slimmer and slimmer with each blown save (having blown four in nine chances). Parnell may be the natural choice for closer. Acosta might just be the better choice. The Mets have a terrible bullpen (15th in NL with a .316 ERA) and it needs a total overhaul. The average NL reliever has a .358 ERA and only Byrdak and Acosta are better than average. WHIP the average NL reliever is 1.30 and Beato (1.23) Acosta and Izzy (both 1.29) are above average. Nobody in this bullpen deserves to be a closer, so why do you need to designate one? The Mets need to bring in some above average relief arms next year and rotate them through the late innings. Maybe one will surface to the top, maybe not, but what they lack in one quality closer (which they can’t seem to afford) may be well served in quantity of better relievers. Correction: 15th in NL with a .416 (not .316) era.